MANILA, Philippines — The Philippines’ Government Arsenal and South Korea firms Samyang Comtech and Buhueng Precision on Friday launched the construction of manufacturing plants for force protection equipment and 5.56 mm magazines in Bataan. It can be recalled that the Philippines and South Korea agreed to a co-production deal, which stemmed from a 2013 Memorandum of Understanding on logistics and defense cooperation. 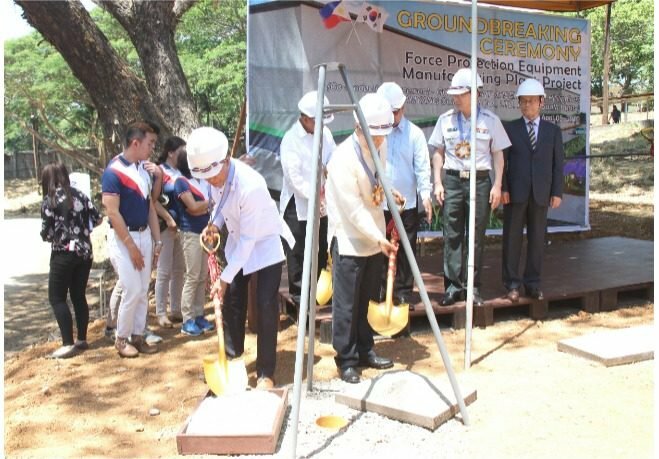 Defense Secretary Delfin Lorenzana, together with Republic of Korea Ambassador to Manila Han Dongman, Samyang Comtech representative Kim Jong-il, Bu Hueng Precision Co. Ltd. President Min Hung-ki led the groundbreaking ceremony at the Government Arsenal’s headquarters at Camp Antonio Luna in Limay, Bataan. Samyang and BuHueng will eventually transfer to the Government Arsenal the technology for the production and testing of force protection equipment like armor vests and ballistic helmets, as well as gun magazines. “We submitted a bill to convert this area into a defense industrial complex so that we can have right to investors, we can enjoy tax holidays or incentives and then later on we can export also from this place anything that we manufacture here,” Lorenzana said in his speech. Samyang’s facilities are expected to have an annual capacity of 20,000 sets of armored vest and ballistic helmets. BuHeung Precision will put up a 5.56mm 30-round magazine manufacturing plant that will supply the Philippine military. “The project will also be good to the province of Bataan because the project will also generate investment and employment for the people here,” Lorenzana said. The technology to be transferred would help develop the country’s self-reliance defense capability. At the moment, the military and law enforcement agencies are dependent overseas for their force protection equipment.